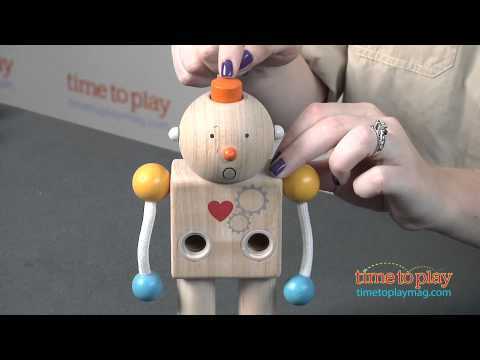 With Build-A-Robot, preschoolers can add one of four different heads to the wooden robot body. Each head shows a different emotion: happy, angry, sad, and surprised. Each head also has a different tactile feature. There are red and white balls all over the angry head. Press the orange button on top of the surprised head to hear a squeak. There is a fabric circle on top of the sad head. And the happy head has a ridged top. The robot’s arms and legs are movable. Kids can place the legs in the holes on the bottom of the robot to make it stand or place the legs in the holes on the robot’s stomach to make the robot sit.